I was actually very excited about this, but the unboxing gave me a huge disappointment at first: the side handle (if you look at the case upright) is totally unbalanced. 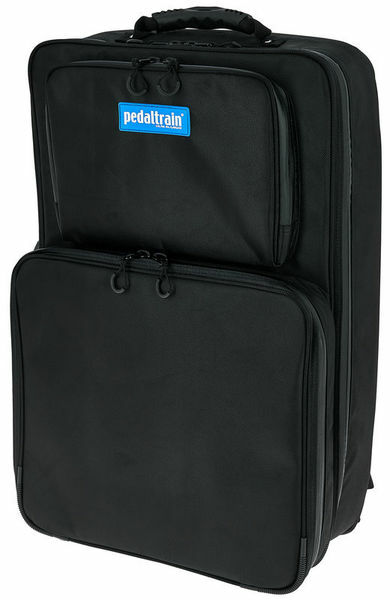 Looking at the pictures here and in The Pedaltrain website I would say it's not up to the standard, so it could be bad luck... still, it shouldn't have been sold in the first place... Plus, the zipper doesn't run smoothly. It could be a matter of using it a little, but it doesn't feel like good quality stuff. I am not going through the hassle to send it back and wait for a new one. I own already the hard case for the Novo 24. This one is the "backpack" alternative for when I have to walk longer distances, so the handle can stay unbalanced and we'll pray for the zipper. The great thing about it: the pockets are huge. All the cables and things I did not know how to keep together fit perfectly. All in all it seems to be a decent product. Hopefully it will last. ID: 437159 © 1996–2019 Thomann GmbH Thomann loves you, because you rock!